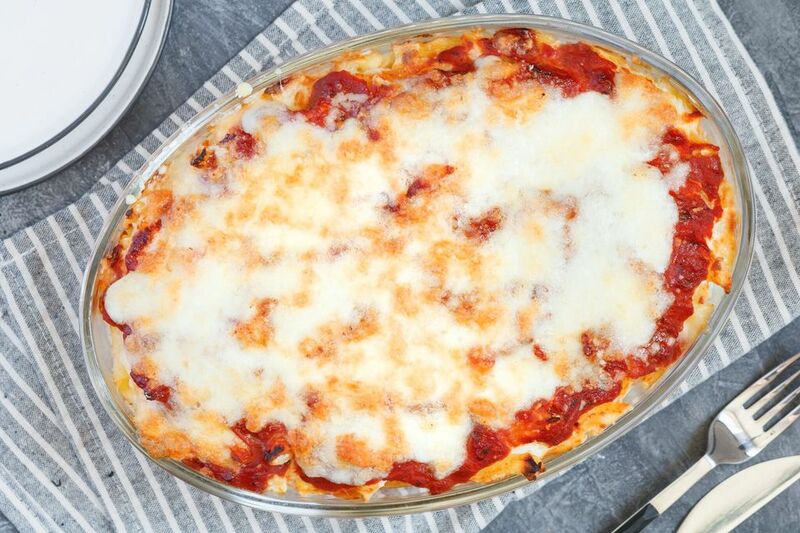 This delicious baked ziti recipe is made with plenty of sauce and cheese. Ricotta cheese, mozzarella, and Parmesan make this a hearty, satisfying casserole and, if you use a meat-free sauce, it's a vegetarian dish. Feel free to make a meat sauce to add to the pasta bake or use a store-bought marinara or traditional spaghetti sauce. This recipe calls for 2 cups of mozzarella cheese, half for the pasta and half for the melty topping, but you can omit the cheese topping if you'd like. Heat the oven to 350 F (180 C/Gas 4). Butter a 9-by-13-by-2-inch baking pan. Cook the ziti or similar pasta in boiling salted water following the package instructions. Drain well. In a large bowl, combine the ricotta cheese, seasoned salt, garlic powder, and half of the mozzarella cheese. Taste and adjust seasoning, as needed. Add the egg and blend well. Stir in the drained pasta and transfer to the prepared baking dish. Pour the spaghetti sauce over all. Bake in the heated oven for 45 minutes. Sprinkle with the remaining cup of mozzarella cheese and the 1/4 cup of Parmesan cheese, and bake for 5 minutes longer, or until the mozzarella cheese has melted. Serve the ziti casserole with a fresh tossed salad and hot baked or grilled garlic bread. This is a great picnic or potluck dish. It can be made in advance and freezes well. With Meat Sauce: ​In a skillet over medium heat, sauté 1 pound of lean ground beef in a few teaspoons of olive oil until beef is no longer pink. Add the spaghetti sauce to the browned beef and pour over the ziti before baking. If desired, sauté about 1/2 cup of chopped onion with the ground beef. With Onion and Peppers: ​In a large skillet over medium heat, saute 1 cup of chopped onion and 1/2 cup of chopped bell pepper until the onion is translucent and bell pepper is tender. Add the mixture to the ziti with the cheeses.